The good news is the Jets didn't lose last week. They were off. The truly bad news is that they might not win for the rest of the year. What the heck happened? Last year they went 10 and 6. They beat the Patriots once. They made the playoffs. The coach was "Mangenius." Life was good. Well, a number of things happened. First off, they didn't get the easy schedule this time around. Next, the offensive line lost its glue. Guard Pete Kendell, neatly placed between rookies Mangold and Ferguson and who tutored them well, left to be replaced by an even greener castoff. But mostly...the Jets aren't very talented. Last year, they could mask that somewhat with smoke and mirrors and a weak schedule. This year, not so much. Which is why I think this year's problems all started at the draft. Which is not to knock the guys we got. From every indication, the two guys we got up top are good. Revis should be a nice corner and Harris seems like every bit the inside linebacker a 3-4 defense needs. The problem stems from the fact that we weren't two players away from contention. We are a whole lot of players away. To trade away picks when we needed a great many players was silly, if not stupid. Another problem; the players on our defense were picked and built for an entirely different defense—the one-gap, attack 4-3 defense (similar to Indy's defense). Robertson is a one-gap attack DT; Vilma is a quick, flow-to-the-ball middle linebacker who needs two DT's to cover for him. So to run Mangini's 3-4 two-gap defense—not to mention retool the offensive line and get a new tight end—we needed to restaff most of the Jets team. So in the draft, what did the Jets do? Did they get the big DT they needed? Did they trade Vilma or Robertson who are both obviously ill-suited to this style and try to get more draft picks for them? Did they trade down to get even more picks so they could retool their appropriately named offensive line? And maybe a nice TE? When the Cowboys of the early 90's were terrible, coach (and draft guru) Jimmie Johnson set the blueprint for rebuilding teams. Do your research, set your draft board. And then trade down. Again and again and again. His volume of picks allowed him to build the Cowboy dynasty of the mid-90s. In 1996 when Jimmie was with Miami then, he traded down to accumulate 3 picks in the fifth round. His haul: utility back Jerris McPhail, solid DT Shane Burton, and future hall-of-famer Zach Thomas. Point being, whether it was hubris, ignorance or folly, the Jets were obviously much further away than the two picks they took from this draft. On draft day, I conducted my own mock draft along with the real one. I made it as realistic as possible with trades being positive for both teams, finances included. In this draft, I traded Jon Vilma and Dewayne Robertson to the Redskins for the number 6 pick. Washington needed run support and they run an attack 4-3 defense; perfect for Vilma and Robertson. I then traded back to get run-stuffing ILB Patrick Willis (who's doing great in the 3-4 defense out in San Fran). For the rest of the draft, I followed Jimmie Johnson's philosophy and traded back, then took players who fit the Jet's new defense. The result was a 9-player draft with more picks for next year's draft as well. I took young offensive linemen, cornerbacks, a big 3-4 nose tackle, rush linebackers. But no TE. Nobody's perfect. But since this never happened, what we have instead are the Jets of now. Vilma likely will be traded this off-season, one year too late—with his knee injury, his value will definitely take a hit. Robertson can't anchor the Jets' rush defense, as evidenced by the Jets giving up 296 yards rushing to the Redskins a couple of weeks ago. So far, the Jets have gotten 9 sacks all year; they have given up 23. Their offense is 100% certified crap as well. They don't average 100 yards rushing per game because they allow too many holes on their offensive line. (Granted that might have something to do with defenses stacking up because Chad couldn't throw more than 15 yards downfield with taking a half hour to float one out there.) Their quarterbacks have passed for 11 TDs; this week's opposition, Ben Rothlisberger, has 22. But it's not all face-in-the-mud for the Jets. I hated to see it, but Mangini made the right choice in going to Kellen Clemens—who has a nice early rapport with Cotchery. He will face some touch teams right away—Pittsburg, Dallas, New England—with absolutely nothing to lose. Which will be good experience for him. Revis and Harris, now starters both, will also gain experience and become anchors in the new defense for which they are suited. 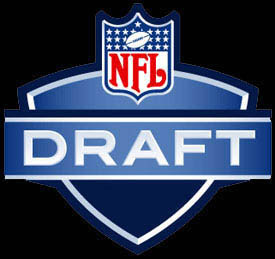 And the best news of all...the 2008 draft is only 163 days away. I think Mangini deserves alot more blame. Last season, Mangini was credited with sharp play-calling, and had his team very well prepared every week. I thought beating the Patriots and almost beating the Colts showed that the team's success wasn't all due to the "soft" schedule. This season, they seem to be suffering from poor strategic and tactical decisions. From the poor draft, to the poor handling of the Kendall situation, to the overuse of Pennington and underuse of Thomas Jones, and the ill-advised switch from a 4-3 to a 3-4 defense...Doesn't Mangini have to answer for this? I agree with r-nav. Mangini managed to pull out a victory in today's game, but it still showed many weaknesses in the coaching. They led the Steelers early and had to win in OT after having another awful second half. The announcers showed some stats that were scary. In the first half, the Jets net something like 17 points over opponents cumulatively. In the second half, they are like -80. NEGATIVE 80!?!?! He might have some good plays, but the other teams adapt and he does not. From lax second halves to forcing a defence on a team without the right personnel, Mangini has shown many coaching mistakes. And yes, I hate the man. When I met him, he was a complete a-hole. And all the people that I know that know him hate him too. He showed up to a Wesleyan reunion a few years ago decked out in Patriots gear and had a wall of huge guys keeping all his "friends" away from him. He was an arrogant fool who rode on the graces of a real coach. A coach is not defined by the good times, as much as the bad. 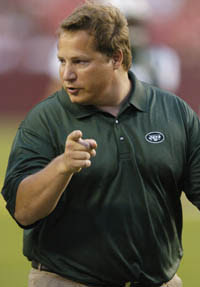 If Mangini was really a good coach, he would be able to improve the Jets, instead of watch them implode. Without fellow Wesleyan alum Belichick saving his hide, Mangini would be back stuck in some foreign league dreaming of playing with the big boys. Mangenius? I think not. Mangina is more like it. As to the bad coaching, I think dallasfan is wrong about the Jets game yesterday. The Steelers had the no 1. defense against the run and against the pass (which is unheard of), and the Jets we're starting a untested QB. The fact that without an injured Coles they managed to beat the crazy-aweseom Steelers D is amazing. Also, the Steelers had 23 sacks against them all year, and the Jets got 71/2 against them yesterday. I was very impressed with the gameplan against the Steelers. As to the personal....I really don't have any comment. Is Belichek a tool. Most Def. Was Parcells a complete jerk...probably. Was Pat Riley weak...yes. Did that not make them good coaches. No, they are the best at what they do. P-Cat, you are totally wrong about the Jets game (yes, I just challenged you on sports, lol). On my original blog entry, I mention that Mangina can come up with good plans, but you have to admit he falters after the initial shock wears off. The other team adapts and he can't. The fact that the team ALWAYS implodes in the second half is a sign of bad coaching. This season they blow double digits leads and can't finish a game. I give the Jets credit for beating a better team in OT. I would respect them more if they played tough all game and just plain won. The rookie QB is showing a lot of resolve in a bad situations. Mangina does not. You mention how great the Steelers defence is. Why is it that good? Because Mike Tomlin, although a follower of Dungy's Tampa 2 defence, stayed with a 3-4 defence that the Steelers are known for. Tomlin said that he is "interested in winning games. I am not interested in putting my stamp on a defense just because that happens to be my area of expertise." That is why the Steelers are #1 in total defense, #1 against the run and #1 in points allowed while Mangini's mis-managed defense is 30th, 32nd and 27th respectively. Mangina has moments, but ultimately is a flawed coach. His stats show it. Tomlin knows it. And all the other guys on the unemployment line will know it when Mangina gets the boot by the end of next year. And I just mentioned that Mangina is a tool as a topper. A bad or mediocre coach is less likable if he is a tool. The fact that I know him and can testify to how much of an arrogant fool he is is entirely beside the point. Lets compare him to, say, a Tom Landry, who in addition to actually being a great coach was the type of guy to go have a steak dinner with Lombardi the night before the game. It was time for Landry to retire when he was let go and he deserved better. Mangina is wasting the opportunity presented to him and should return to whatever scrub league he came from. On that day, I will gladly wear the colors of Gang Green and not until then. Bill Belichek also disagrees. Mangini made him his defensive backs coach at 29. Then, in 2003, despite being the youngest guy in the New England coaching staff's room, Belichek followed Mangini's advice and made Troy Brown—a wide receiver for his entire 12-year career—a cornerback —even in Super Bowl 39. Why? Because he knew Mangini could coach him into being a viable corner. That season, despite being decimated by injuries and having only one starter playing from the previous season, New England's pass defense led the NFL in interceptions, fewest touchdown receptions allowed , opponents' passer rating and pass deflections. That postseason, defensive backs recorded six interceptions in three games. Oh, and Brown ranked second on the team with three interceptions. You know who else disagrees. The NFL. Last season, he was named AFC Coach of the Year . He came second in leaguewide voting. You say that Mangini can come up with good plans, but falters after the initial shock wears off. "The other team adapts and he can't." Hmm, ok. Let me ask you…this week, against the Steelers, who won? And more importantly, how did they win? After Pittsburg came back to take the lead in the 4th quarter…what happened? Did the Jets adapt? Did they get the ball at their own 14-yard line with under 2:25 left, then take their inexperienced QB down the field and kick the tying field goal? In overtime, what happened? Did they totally shut down Roethisberger (who just last week brought his team back from being down 21-3) with a sack right up his face? Did they stop Pittsburg with a 3 and out? Then turn around and kick the winning field goal? Seems like he adapted just fine to me. You say “The rookie QB is showing a lot of resolve in a bad situations.” But that Mangini does not. Who the heck do you think coaches this kid? Who prepares him? Who gives him the game plan and creates the sense of confidence in him, so that he can go out on the field and make the plays? Who coaches to his tools, designs controlled rollouts, scrambles, and more passes to the tight ends for his benefit? As for changing a team’s defense…what do you think Belichek did when he got to New England? Former coach Pete Carroll ran a different defense, so when Belichek got there and wanted to install his own 3-4 two-gap defense, he had to go out and get all new personnel. He brought in Richard Seymour, Ty Warren and Vince Wilfork for his down linemen, and corners who could cover man-to-man for his defense. But this took time— not all in one year, not two years. And you say that Mangini is a flawed coach and Tomlin knows it. What the hell makes you say that? WTF makes you think that? That’s the silliest damn thing I’ve heard. Mangini…”should return to whatever scrub league he came from.” Yeah, that would be the NFL. He became a ball boy at 23, then worked 18 hours a day in the Cleveland Brown PR department, then moved up to accumulate stats for the coaching staff. Belichek thought so highly of this kid, he gave him a job on his coaching staff. At 23. You say "I give the Jets credit for beating a better team in OT. I would respect them more if they played tough all game and just plain won." Ok, no, this is the silliest thing I’ve ever heard. I’m not saying he is the best coach in the world. I’ve made my points about mistakes he and the Jets GM made. They need better players…simply put, they are overmatched in most positions. Which might be a credit to Mangini that he just beat a great team in Pittsburg. I am saying your letting personal judgments about him cloud your vision. He may or may not be a total toolbox. I don’t know the man…and as far as this conversation goes, I don’t care. His coaching is in question. And so far, he’s shown me enough to give him a chance. P-Cat, I suggest you not personally attack your posters, especially if you need to take certain facts into consideration. "And you say that Mangini is a flawed coach and Tomlin knows it. What the hell makes you say that? WTF makes you think that? That’s the silliest damn thing I’ve heard." You know how I know that, it was in the papers as a quote from him. Tomlin was making several not-so-veiled references about Mangini. "Mangini…”should return to whatever scrub league he came from.” Yeah, that would be the NFL." Again, wrong. He started in Melbourne, Australia at a semi-pro team. Then, he got started in the NFL thanks to his family connections (in-laws are a sports agent and a GM of the Cleveland Indians) and his fellow alum and frat brother (Belichick). And, yes, he impressed them by making photocopies for 18 straight hours. You point to a handful of stops in 1 game while totally ignoring the fact that he let the Steelers come back in the first place and has a habit of doing that (NEGATIVE 80 points net points in that second half prior to this game). The only reason why the Jets are not in the basement is because Miami is even worse. Stop getting lost in the trees of the Steelers game and look at the forest of failure that is his second half record. Ty Law? Wasn't that at the Patriots as a defensive coordinator under the guidance of a defensively minded mentor. Maybe Mangini is a great defensive coordinator. Maybe he should go back to that. He won AFC Coach of the Year. Yep. That was last year. Now he has gone 2-8. His total record is now 12-14. That follows his tendency to start strong and fall off. You use Belichick's succesful switching of defensive schemes to defend Mangini. Bill did it better. You admit Bill got the personnel he needed. Mangini hasn't. And gives away points in the second half. You say I am letting personal judgements cloud my vision. Yeah. Come on, we are dealing with a game. We live vicariously through grown men playing games. Personal reasons are as good a reason as any to like or dislike a coach. As the only person on the board who knows Mangina (admittedly not that well, but also through lots of other people), I can testify that he is an idiot and worthy of contempt. But you are also a Jets fan and might be just as clouded, in the other direction. Mangina is not the worst coach in the league, but he has made many mistakes, a losing record and a black hole for a second half. Oh, yeah. And he in an a-hole. Well, actually, while I am well aware Mangini might have coached the Melbourne League as a semester abroad (which is why knew of, and brought the Jets punter from Australia), to use a semester abroad as a league to back to is kinda silly, dude. Do you really think Belichek promoted him repeatedly to be a defensive coordinator at 32 because he made copies? Tomlin, in my opinion did not make a veiled threat...the daily papers notwithstanding. And again, I'm not saying he is coach of the century...he has a very flawed team. But to say he can't adjust is just plain silly. Especially coming after the week the Jets just did. Also, to not expect the Steelers to come back is just unrealistic. As I just wrote in this blog, faulting the Jets for not getting the personnel they needed in this draft, the Jets have many, many problems. However I'm not throwing in the towel after one season—a season where I said in advance the Jets were going to be bad. If you remember, I predicted the Jets to go 5-11. The Jets have many flaws. But to call him a scrub is just over-the-top dude.